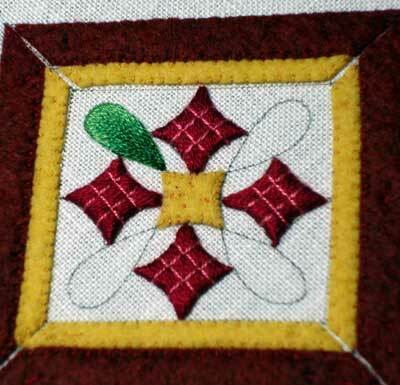 Embroidered Christmas Ornament: Which Direction? When I first designed this Christmas ornament, my plan was that it would hang on point, so it would be diamond-shaped. Then I started stitching, and a lot of things happend. First, the embroidered red things – originally, they were going to be shaded long and short stitch, raised on felt. But I started that, and I thought… you know, I’m going to see what satin stitch looks like first. I have a real thing for satin stitch – I just like it a lot. So I tried the satin stitch, and I found I liked it, so I stuck with that. The red diamonds will be outlined with an edge of gold, to finish them off. 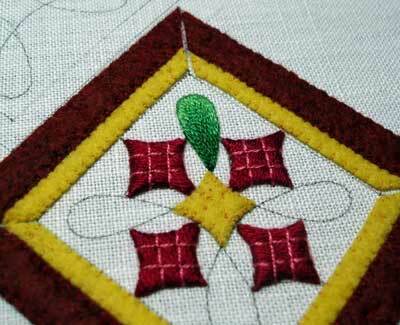 Then, I thought a lattice might look nice over the top of the satin stitch, in a lighter shade of the same colors. These colors will be repeated on the border, in an Or Nue bit. So, I did the lattice couching. I like sparkly Christmas ornaments. There’s going to be stuff on here, aside from the embroidery – and in the middle of the red things, I want to put a little gold pailette. So that lattice forms the framework for a tiny pailette. If it looks ok, I’ll leave it. Who knows, I might change my mind! Now, in the longer, petal-looking areas (where the green shading has been started), I was originally going to trim down some beetle wings to fit right in there, and surround them by pearl purl. But – I didn’t like the color of the beetle wings with the color of the reds. So I scratched that altogether, and decided to do the green shading. I think I’m going to like it better! This is the dilemma, though. On point – diamond-shaped, that is – see the direction of the red diamonds and the lattice? It’s looking rather square, isn’t it? I think I like the red diamonds better this direction! So here’s my question: Which direction should the ornament hang? Perhaps it’s a little early to decide – maybe it will be easier to decide once all the green shading is finished. But I want to make a “final” decision on this dilemma before I begin the layers of goldwork around the outside, since I think the direction the ornament is to be hung will change the approach I take to the various colors…. What do YOU think? Any preference? Any insight to the look of the design, or to the way it will hang if hung as a square instead of a diamond?? Let me know your thoughts!! I like it square at this stage. The green petals stand out more. Can’t wait to see it with all the goldwork! Well here goes with my opinion. I like the look better hung as a diamond. As a square it tends to look a bit clunky. Having said that, however, it sure is spectacular! I really enjoy checking out what you are working on. It’s way beyond my skill set, but that’s okay. I do more quilting than stitching anyway. Keep wowing us! Well, just to confuse the issue…I like the red diamonds/green petals better in the format when it is hung as a square, but prefer the ornament as a diamond. I agree that when hung as a square it feels clunky. It makes me wish the interior could be turned so that it hung as a diamond in the configuration the center is in when we see it here as a square. Either way, it is gorgeous and beautiful word. It will be magnificent however it gets finished. I agree with Candyce, but I think the result any way will look beautiful, Mary!! First of all its gorgeous! I went with how my eyes moved over it and what was the most pleasing to my eyes. I ended up with having it hang on point. My eyes traveled up and down easier and still was able to encompass the entire piece with ease. When I looked at it as a square, my eyes went back and forth and up and down and not seeing it as a complete piece at first making it hard to focus. I hope this doesn’t confuse anyone? Maybe this all just boils down to “Old Age” ha ha. I started out in college as an art major but was strongly discouraged to continue and ended up in the mental health field…ha ha maybe my comment is why. Hang it square B-U-T : First ADD some outside points to it. Making it with points on each “side” so that it has eight points. It gives more decorative options too. So-it will stay square BUT ! will HANG diamond! It’s gorgeous no matter which way you look at it. But from a balance perspective, I prefer the ornament on square. It just “looks” right. Actually I really like them both but if I had to choose I think the diamond shape would look spectacular hanging on MY tree.lol. I think it all should be on point. I think it looks more chrismasy with the ornament square. The central motif looks more holiday-motif related and stronger than the frame with the ornament edges on square. Hard to describe, sorry, but when you pull back and look at the whole picture, the square just looks to me more like an ornament. On point, the central motif gets lost in the outer frame. The weight of the frame overwhelms the center of the ornament. Hope this makes sense. Take a look at the ornament from a little further back. I think you get a different perspective. Your work is so beautiful and you make it look so easy. I thoroughly enjoy reading your entries. Thank you for letting me ride along! Best wishes in making your decision. Previous Previous post: The Royal School of Needlework is Back in the US!